Hey y’all!! Are you as surprised as I am that I’ve been posting so much? I just have so much I want to share with you all before Christmas!! This past weekend we finally got our turn with that horrible cold front that was moving across the country and since we were trapped inside I started round one of my holiday baking. It was fun experimenting with lots of old and new recipe ideas and I had some winners of the bunch so the next few days will be full of recipes. 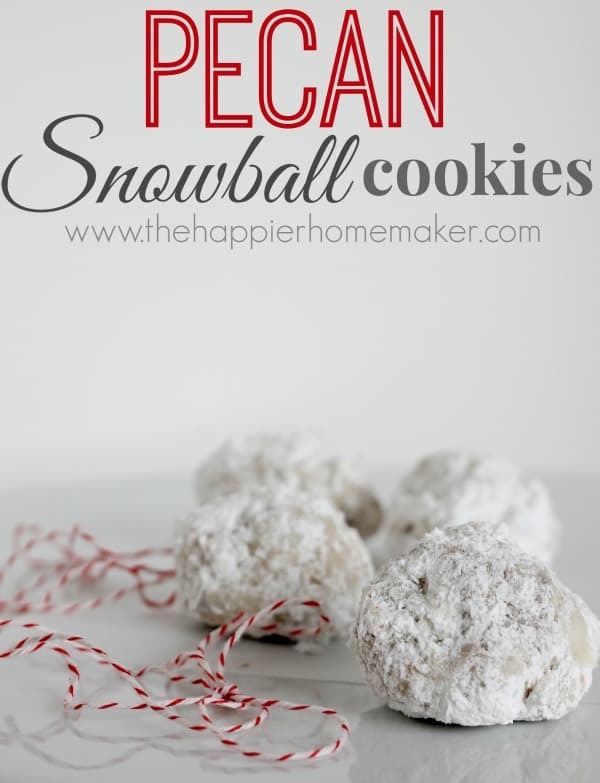 I will start with one of my favorite classic recipes- Pecan Snowball Cookies! I love these cookies, they were one of my favorites growing up-they just melt in your mouth! My grandma used to make them and I loved helping her, delicately dipping the cookies in the powdered sugar while they were still warm from the oven! Unfortunately, my three boys don’t love helping me make them, but they sure love eating them up once they are done! Soft and buttery, melt in your mouth pecan cookie combines with a generous coating of powdered sugar for dessert perfection! Bake 10 minutes at 350 degrees on parchment paper lined baking sheet for 10 minutes or until slightly browned. Roll balls in powdered sugar while still warm. I like to package these cookies up in these cute reindeer gift bags when gifting to kids, they always love it! 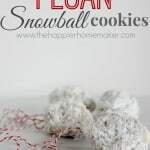 YUM – these are one of my favorite cookies and I don’t think I ever had a recipe! Perfect! Those were always my favorite kind of cookies. I’ll have to try and make them gluten free! YUM. I love them too Gwen, let me know if you make a gluten free version and I’ll link to it from this post! Delicious! Pinning this for sure. I love pecans. Oh man, these look so good. I’d kill for a cup of milk and these cookies right now! I’ve had a bit too many cookies lately with all this baking Vanessa!! I need to mail all these away asap! I only bake two different cookies every Christmas and this is one of them! Soooo delish!